JetBlue switched to a new uniform last year, but found an eco-way to keep all the old, worn and never-worn crew uniforms out of landfills. 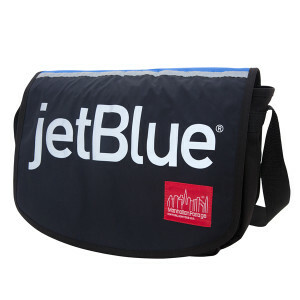 JetBlue joined up with Manhattan Portage, the company that first popularized and continues to make iconic New York City bicycle messenger bags and this week (just in time for Earth Day) rolled out the “JetBlue Uniform Bag Collection,” a line of five items made from unworn recycled uniforms and available online and in Manhattan Portage stores. The toiletry case ($39) exteriors are made from JetBlue’s signature windowpane flight attendant shirts, the linings are made of scarves, and the handles are former neckties. The City Lights bag ($45) is made out of recycled pilot shirts, with intact pockets and pilot wings. The Sohobo bags ($89) were once all-weather jackets, the backpack ($109) is made from recycled JetBlue rain pants and all-weather vests have been turned into Europa bags ($115). While the new line of upcycled bags puts unworn uniforms to good use, JetBlue also found a way to recycle the old uniforms crewmembers wore. In 2014, the airline donated 37,000 pounds of old uniforms, clothing and fabrics to a non-profit that planned to sell the material and use the proceeds to support a variety of programs in Africa, Asia, the Caribbean and Latin America. Old fabrics from other airlines are also being upcycled. 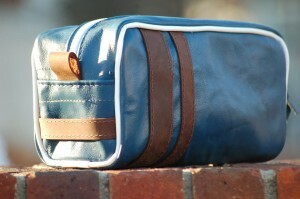 Skyebags turns recycled aircraft leather from Delta Air Lines into wallets, toiletry bags and totes. Leather from replaced leather seats on Alaska Airlines is being reborn as carry-on bags in a line by Mariclaro. And while Looptworks has sold out of the totes it was making out of leather from old Southwest Airlines seats, its LUV line still has some duffle bags, toiletry cases and backpacks for sale. The Burning Man festival in the Nevada desert is wrapping up and more than 70,000 attendees are leaving Black Rock City – with their garbage. There’s a recycling program at the festival, but all participants are required to remove their own trash and dispose of it elsewhere – in trash disposal stations in neighboring towns or perhaps in the giant trash bins set up at Reno-Tahoe International Airport. Airports are installing solar farms and wind turbines and getting serious about recycling food waste and other materials generated inside the terminals. Airlines are rolling out in-flight recycling programs and having flight attendants separate the trash they collect as they go up and down the aisles. Delta Air Lines gives its old seat covers to Tierra Ideas, which turns them into cool bags. And now Air France is collecting old uniforms from ground staff and crew uniforms at Paris-Orly and Paris-Charles de Gaulle airports so that the clothing can be recycled as car insulation at a specialized recycling plant. For my At the Airport column in USATODAY.com this month I offered a fun round-up of items being recycled by airports and airlines in an effort to be help save the earth and, in some cases, to save some serious money. You can read the full column, For airports and airlines, creative recyling brings cost savings, on the USA TODAY website but briefly, the list I included ranges from airports that recycle, reuse or re-purpose everything from old metal detectors, used de-icing fluid and concrete from old runways to creative partnerships between airports or airlines and local non-profits and green businesses. And old seat covers from Delta and re-branded Northwest airplanes that could have ended up in a landfill somewhere were instead donated to Tierra Ideas, a small North Carolina company that is recycling the bags as messenger bags, laptop cases and other travel accessories with patterns that will very familiar to frequent fliers on those airlines. And – here’s something that didn’t fit in the column: On May 17th, Purdue University Airport, in West Lafayette, IN will be recyling this 737 aircraft. The aircraft is a 41 year old Boeing 737-200 donated to the University by United Airlines fifteen years ago for research and training purposes in Purdue’s Aviation Technology Program. While researching a story about recycling efforts by airlines and airports, I came across Worn Again, a London company that made a line of small bags and jackets out of a decommissioned Virgin hot air balloon (you can order items in any color, as long as its red). Worn Again also makes a variety of accessories out of decommissioned Eurostar uniforms. And while everything in the on-line store is very eco and desirable, everything is beyond the $10 limit we set for Souvenir Sunday. Except this: a mobile phone holder made from decommissioned Eurostar staff cardigan uniforms. Looks more like a lost sock to me; but I applaud the concept. Have you found a great souvenir while Stuck at the Airport? If it’s $10 or under, “of” the city or region and, ideally a bit offbeat, please snap a photo, jot down some notes and send them along. You souvenir may be featured on a future edition of Souvenir Sunday. And if you find a great local food at an airport, take a photo of that too. We’re thinking of making Snack Saturday a permanent feature.